Freddy Benson, a con(fidence) man, lives off women by waking their compassion with shocking stories about his fake fate. One day in beautiful Beaumont sur Mer, he meets Lawrence Jamieson, who shares the same passion, works the rich ladies with the same scheme, but in quite a different league. With the knowledge of his profession, Freddy forces Lawrence to teach him high-society behaviour, so that he himself can earn a major living. When time comes to say goodbye, Freddy decides to stay a little longer. As there is no way two con men can work a town that small at the same time, Lawrence and Freddy agree on a settlement: The first one to extract $50.000 from a young female target wins, the other leaves town. The sum is no match for Lawrence, the age of the lady no match for Freddy. Let the games begin! 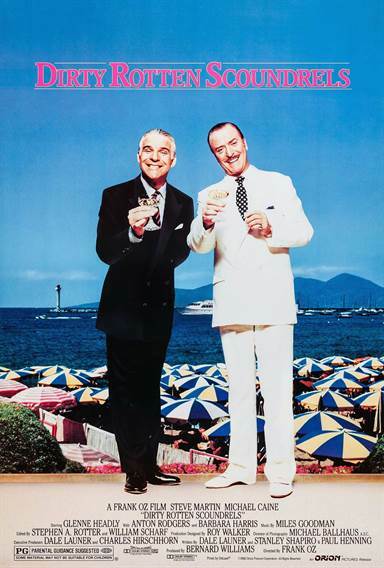 Download Dirty Rotten Scoundrels in Digital HD from the iTunes store. Dirty Rotten Scoundrels images are © Orion Pictures. All Rights Reserved.